In this guide to film formats, we’ll explain what film formats there are. And discuss the differences between 35mm, medium format and large format film. In this guide to film formats, we will talk you through the various different options when it comes to film size. Basically, a film’s format is the size of the film. The most popular formats, and also the most widely available, are 35mm, medium format and large format. Some other, lesser used formats such as 127, 110 and APS, are available, but they aren’t as easy to get hold of. The difference in size between the formats has a big impact on the final image you will get. The smaller the format the more visible grain there is. These films also tend to have more variety. Large format film will give you more detail and very little grain, but your options are more limited. Considering what film format is best for you is a vital step when it comes to picking the right camera. This is because a camera will only work with one type of film. 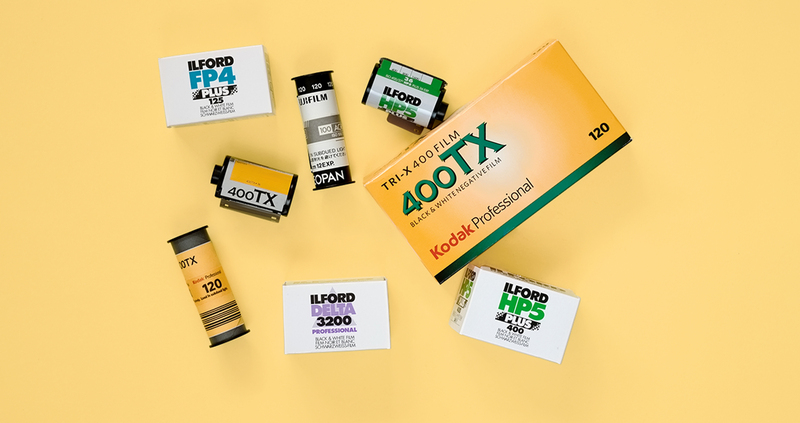 Our guide to film formats will help give you an idea of why you would pick one format over another. 35mm film is easily the most popular choice. It was first made available in 1934. Most people are familiar with this format, it comes as a cartridge that fits into all 35mm film cameras. It is the easiest way to shoot film, it is the most portable and the most common. You generally get 36 exposures per roll, which also makes it the most economical per shot. There are a couple of variations to the 35mm format. You can get half frame cameras that will shoot twice as many images, at half the size, on a roll of 35mm film. Or you can get panoramic cameras, which will shoot a much wider image on the same size film. Because it’s the most popular, 35mm also has the widest range of emulsions to choose from. If you are new to film photography a 35mm camera is a great place to start. We recommend a roll of Kodak Colorplus 200 to get you started. It is reliable but not too expensive for those mistakes you make along the way. Medium format is also known as 120 film. It is 6 cm wide and different cameras shoot different variations of frame length. There is 6×4.5, 6×6, 6×7, 6×9 and panoramic 6×17. In each case, the numbers refer to the frame size in cm. Therefore, 6×6 will produce a 6 cm by 6 cm negative. The amount of images you get per medium format film depends on the specific format you are using. A 6×4.5 camera allows 16 frames per roll, 6×6 provides 12, 6×7 gives 10, and 6×9 allows you 8 shots. With 6×17 you get usually get 3. The area of the image is much bigger than 35mm, giving you more detail and much less grain. Medium format sits nicely between 35mm and large format. A medium format camera remains fairly portable but gives a much larger image size than 35mm. If you’re shooting 120 for the first time give Ilford HP5 400 Plus or Kodak Portra 400 a try. These are both really popular emulsions with medium format shooters. Large format film is the oldest format still available. This film comes in sheets instead of rolls. Which is why it is often referred to as sheet film. The most popular sizes are 4×5 and 8×10, but larger sizes can be bought once a year from Ilford. The numbers refer to the frame size in inches. Therefore, 4×5 will produce a 4 in by 5 in negative and 8×10 will produce a huge 8 in by 10 in negative. Your camera size will determine the size of film you need. 4×5 is definitely the most common large format camera. When you shoot large format film you work at a much slower pace. This is partly to do with the cost of the film, as you have to make every shot count. And also partly to do with how the cameras function. Setting up and focussing a large format camera is a more involved process requiring more time and effort. The main benefit of large format film is the level of detail you can get. Because of the size of the image the level of grain much smaller. You also get a lot more control over the image with all the features of a large format camera. Tilt and shift functions allow you to straighten angles and have the entire image in focus. Fomapan 100 is a good place to start when you first shoot large format film. It is by far the most affordable choice and you get 50 sheets to get stuck into. These images show relative size comparisons between film formats, not the actual size of each. If you’re new to film then read our Beginners Guide To Film Photography.